The number of people who have died has now hit 1,069. THE WORLD HEALTH Organisation has told travellers that the risk of getting Ebola on an airplane remains very low. WHO said that the risk of passengers or crew having contact with a victim’s body fluids is extremely small, even if someone is sick with Ebola. The organisation has advised against any travel bans being put in place on affected countries, pointing out that when someone is sick with the virus, they were usually so unwell that they can’t travel. 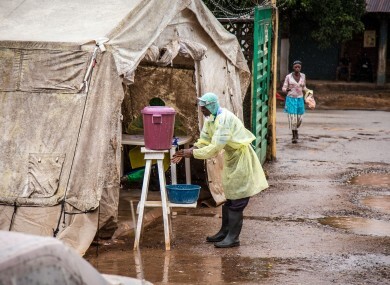 “Unlike infections such as influenza or tuberculosis, Ebola is not airborne,” said Dr Isabelle Nuttall of WHO. “It can only be transmitted by direct contact with the body fluids of a person who is sick with the disease”. “Because the risk of Ebola transmissions on airplanes is so low, WHO does not consider air transport hubs at high risk for further spread of Ebola”. An estimated 1,069 people have died in four countries in what is believed to be the worst ever outbreak of the highly contagious disease. Guinea has been worst hit with 377 deaths so far, closely followed by Liberia where 355 people have died, and Sierra Leone with 334 deaths. Three people have also died in Nigeria. The US has this afternoon ordered any family members of people working at its embassy in Sierra Leone to leave the country due to the outbreak. WHO also confirmed that Kenya is a “high-risk” country due to its position as a transport hub. Email “WHO says you're unlikely to get Ebola on a plane”. Feedback on “WHO says you're unlikely to get Ebola on a plane”.